The friends and members of Townley Parker Lodge No 1032 gathered to celebrate the 50 years membership of the Craft by Richard Higson. Stewart Seddon (left) presents a certificate of appreciation to Richard Higson. 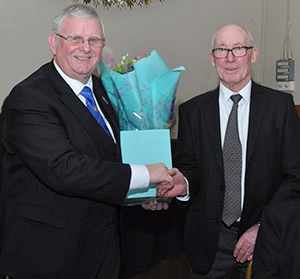 Peter Leigh, the master of the lodge, after opening the lodge and conducting the necessary business, welcomed Assistant Provincial Grand Master Stewart Seddon into the lodge. Stewart was accompanied by Tom Jackson, Paul Renton, Chorley Group Chairman Peter Lockett, group secretary Don Hesketh, group treasurer Mike Silver with acting Provincial grand officers Mark Howard, John Anderson, Mike Pinckard, John Riley and supported by Provincial Deputy Grand Director of Ceremonies Ian Halsall. After being offered the gavel and accepting it, Stewart occupied the chair of the lodge and asked for Richard to be placed in a prominent position. Stewart began by saying: ”Our next business is to celebrate 50 years in Freemasonry by Richard Higson, Past Provincial Junior Grand Warden of the Province of West Lancashire.” Stewart continued: “This evening we are summoned to a very special meeting to honour and pay tribute to one who has served the Craft, loyally and faithfully for 50 years and it is so nice to see so many brethren here this evening sharing in Richard’s special occasion, this wonderful milestone on his Masonic journey and he can now add ‘golden jubilee’ into his portfolio. Stewart then took everyone back in time to the year 1946, a very important year in history for a number of reasons not least the world slowly but surely recovering from the war. King George VI is on the Throne, Clement Atlee is Prime Minister of the first ruling Labour Government with a majority, a comfortable 146 seats, the United Nations is born on 10 January with the first General Assembly convened at Methodist Central Hall Westminster followed a week later by the first Security Council meeting at Church House in London, the Bank of England is nationalised and Winston Churchill delivers his ‘Iron Curtain’ speech at Westminster College in Fulton, Missouri, on 9 March at Burnden Park there was a disaster when a crowd estimated at 85,000 were watching an FA Cup third round match between Bolton and Stoke City. Shortly after the game started there was a massive crush at the railway end and the crowd began spilling onto the pitch. The game was temporarily stopped as the pitch was cleared. But there was breaking news at Portsmouth on 22 August. Mrs. Alice Higson (nee McWhinney) gave birth to a son to be named Richard Harry. Richards contemporaries include; from the world of stage and screen, Joanna Lumley, Ian Lavender, Maureen Lipman, Charles Dance, Felicity Kendal and Sylvester Stallone. Politicians; Robin Cook, Jack Straw, and Edwina Currie. From the music industry; Dolly Parton, Barry Gibb, Marianne Faithfull, Noddy Holder and Cher. From the sporting world; John Watson (F1) and George Best. Richards father, James Harry Higson DSC (Feb 1942) and Bar (Apr 1943) (Distinguished Service Cross), was a Lieutenant Commander in the Royal Navy and Richard’s mother a solicitor’s secretary. At that time the family home was at St Helen’s Parade, Portsmouth and Richards earliest claim to fame was being christened aboard HMS Victory which at the time his father was the ships Commander. However, when Richard was five the family left Portsmouth and moved to Leyland and soon after Richard’s father bought Brinscall Hall, and his current home is the coach house adjoining the property. Richard attended Laurence House Prep School at St Anne’s and then it was off to Rugby School followed by Bolton Institute of Technology coming away from there with a Diploma in Civil Engineering. Richard is a Member of the Institute of Civil Engineers. In 1969 Richard began his working life with the Lancashire County Council at Preston and remained with that authority all his working life. Richard spent time at Ulverston then it was on to the M58. Richard designed bridges for the M65. Richard also inspected every bridge from Charnock Richard to Kendal and one of Richard’s last jobs was the widening of the Gathurst Viaduct. He retired in 2013 after a career spanning 44 years. In 1969 Richard joined the Sea Cadets as a petty officer and over the years Richard was promoted to Sub Lieutenant, Lieutenant and finally emulated his father with promotion to Lieutenant Commander, One of Richard proudest moments was being invited to the launching of HMS Invincible by Her Majesty The Queen in 1977. Richard stood down as Lt Commander in 1983 but immediately went on the management committee becoming chairman in 2002, a position he held until last year when he retired and was made Honorary President. In 1971 the local Conservative Association held a garden party at Brinscall Hall and Richard’s eagle eye latched on to a young lady called Margaret Jones. They started going out together, the relationship blossomed and they were married at St Mary’s Parish Church, Euxton on 18 March 1972. The honeymoon was a week in Towyn, Wales. Stewart Seddon (left) receives a gift from Peter Leigh. At that time Margaret was employed at the ROF where she was engaged in what Richard describe as ‘something hush hush’. When it was time to start a family, Margaret retired and Richard and Margaret were blessed with three daughters Elizabeth, Victoria and Sarah. When all the children were settled in school Margaret wanted something to do and was one of the earliest volunteers at the Derian House Charity Shop in Chorley. She was a volunteer with the Meals on Wheels service and also looked after a friend’s child to enable her to return to work. Sadly, Margaret passed away in August 2004 not living to see her five grandchildren Harry, James, Olivia, Thomas and Joseph. Richard’s Masonic history began when he was proposed into this lodge by his father James who also had the privilege of initiating Richard on 2 January 1969 at the then Masonic Rooms in Fellery Street. 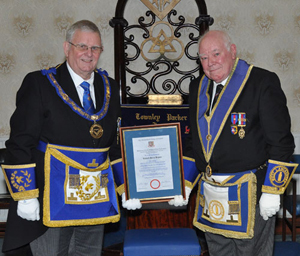 Richard’s uncle Bill, a member of Lodge of Rectitude No 5197 at Bolton was at the ceremony. Richard was passed on 3 April and raised on 4 September. Richard wasn’t at Fellery Street long before a decision was made to leave those premises not least because the owners of Fellery Street cut off the heating. The lodge was consecrated in 1971 by the then Provincial Grand Master Sir Knowles Edge who, following the ceremony, promoted Richard’s father to Past Provincial Grand Deacon. Richard having progressed through all the floor offices was installed as master for the first time on 3 November 1983. He was also master of the lodge in 2004 which must have been a great strain on him just two months after Margaret’s passing. Richard was honoured by the Province in 1994 when he was appointed Past Provincial Junior Grand Deacon. Further promotions came along in 2002 when he was promoted to Past Provincial Grand Superintendent of Works and then in 2011, he was promoted to the very high rank of Past Provincial Junior Grand Warden. Since his last promotion he has continued to do work in the lodge as almoner, junior warden, senior deacon and he has been charity steward since 2017. Richard was exalted into Chorley Chapter No 6287 on 26th November 1985 becoming first principal in 1997. He received his first Provincial honour in 2004 when he was appointed Past Provincial Assistant Grand Director of Ceremonies. In 2011 he was promoted to Past Provincial Grand Sojourner and in 2017 he was further promoted to Past Provincial Grand Sword Bearer. Richard has been almoner of the chapter since 2005 and are also the current secretary. Richard is also a member of a number of other orders. A very comprehensive Masonic CV. There is no doubt at all that Richard’s entire life has also been an example of what makes a good Freemason, as well as a good citizen, a good husband, a good parent, and in every way, a contributor to society as a whole. Peter Lockett then read a certificate, which is an acknowledgement of the Province of West Lancashire’s great appreciation of Richard’s half a century of membership of the Craft. Stewart then presented the certificate to Richard. The ceremony being over the brethren retired to the festive board in a happy and celebratory mood. Pictured from left to right. are: (standing) John Anderson, Mike Silver, Mark Howard, Paul Renton, Peter Lockett, Peter Leigh, Mike Pinckard, Don Hesketh, Ian Halsall and John Riley. (seated) Stewart Seddon (left) and Richard Higson.